A starved dog, who resorted to gnawing off his own foot after being left chained up, is on the road to recovery. 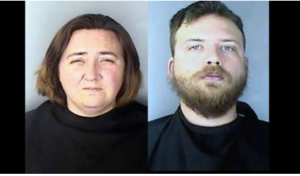 His owners, identified as 32-year-old Jessica James, and 38-year-old Skylar Craft, are facing charges for his dismal condition. Poor Luke has got to be one of the saddest cases we have had in a long time. All of the pups we save are sad and desperate but his reaches down into your Soul. He is so starved that it is hard to believe he has the strength to take two steps. He looks like a dog that is not going to live past the end of the day. His eyes are sunken into the back of his eye socket. His nasal cavity and eyes are infected and drain constantly. I have seen a lot of sick dogs but what has happened to Luke is beyond inhumane. His infection appears to have invaded the bone, and that can cost him his Life. We are not going to risk it which is why we have made this decision. He is strong enough to survive the surgery to remove the leg but not strong enough to withstand the infection if it continues up his leg. we have discovered is he loves everyone and does not have a mean bone in his body. He needed a place where he felt safe, and that is what he has with us. Donations for Luke’s care can be made to the rescue group’s website. They are 2 pigs. They starved the dog but I’m sure they weren’t missing any meals. Lock them in a cell with one meal every other day. 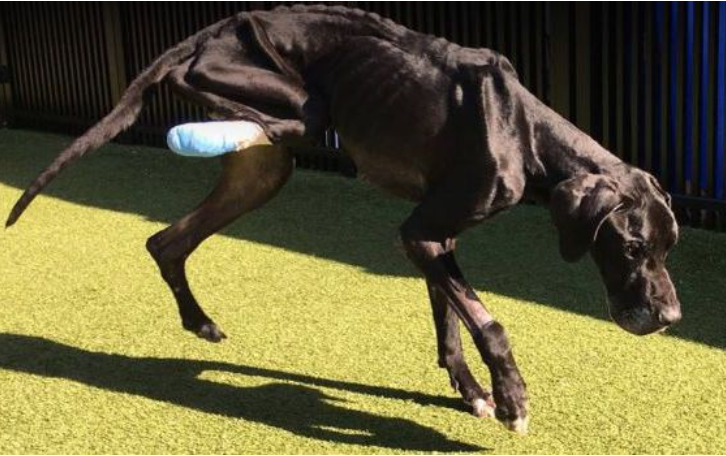 Hope someone throws the book at these cold evil BSTRDS, I would say throw Thier asses in jail but even that would be too good for these monsters, they need something that will slow, agonising and painfully the exact same thing they did to this darling Great Dane. My heart broke when I read the stress and trauma they put him through. Praying he makes a full and healthy recovery. God Bless him for fighting and Surviving this long, hope he has the strength to see this part of the journey right through to the next stage – GETTING HIM THE LOVING HOME HE DESERVES.!! BIG THANKS TO EVERYONE INVOLVED IN HIS CARE AND RESCUE, YOUR ANGELS TO THEM ALL. The death penalty would be too good for these SICK EVIL EXCUSES FOR. HUMAN BEINGS! Throw them to a pack of hungry wolves!